Sports training methodology is characterized primarily by the intensity, duration and frequency of exercise stimuli. A combination of practical experience and scientific evidence, combined with an increasingly important and adequate analysis of recoveries, has been shown to be a prerequisite for an effective workout. A trainer who relies on his experience knows that, although have obtained successful results with an athlete, it is difficult to duplicate the same scheme for a second or third athlete. Similarly, an expert in physiology, scientific research or evidence-based methodologies is not always able to identify an athlete’s real needs from the field, or from the athlete’s feedback. Therefore, in reality, it is the combination of a trainer and an exercise physiologist that best allows an athlete’s experience to accumulate progressively and always to continue increasing in the future, especially when athletes arrive at the level at which their “trainability” becomes increasingly reduced, at which point they would then need to study, test and investigate the areas in which they could still make improvements to their performance. This combination sometimes requires a precise recipe, which is distinguished by a coach’s choices, based on the metabolic needs of the specific discipline. The swimming competitions range between 22 seconds and 15 minutes in length, time intervals whose metabolic demands are mainly covered by both anaerobic and aerobic metabolism. Over the years, numerous scientific papers have analysed the effects of training methods, mostly those used in swimming (based mainly on volumes), to the point where progressive choices and their implementation is increasingly based on scientific evidence. A critical view was put forward by researchers from Indiana University (Stager, 2014), who had studied how the American team used “methodologies based [on those of] Doc Counsilman”, and between the ’60s and the ’80s they have experienced a progressive decrease in volumes, up to 2.8 times lower by the end of the decade. Recent studies have demonstrated, especially in other individual cyclic sports (running, cycling), that an approach more geared to greater intensity could have a positive impact on the physiological responses and performance of the athlete (Bechheit, 2013). Does using science lead to better results? Addressing this aspect in terms of a range of degrees of “faith” is definitely an appropriate approach. Some evidence for this, which is useful for analysis, derives from the fact that France won 12 medals at an international level (i.e., Olympics and world competitions) between 1984 and a further 66 between 1998 and 2013 (Hellard, 2014). The choices they made over the years were only the result of careful selection, evidence-based, and progressively implemented by national coaches and in regional technical courses. Elsewhere in the world, there are well-known cases such as the Australian Institute of Sport leading the research applied to sport and, as recently happened with their adaptation of circadian rhythms for the Rio Olympics, the entire national swimming team promptly responded by showing a strong motivation. Team GB increasingly formulates athletes’ schedules through collaboration at a scientific level, by putting into action the big scheme of work carried out by the UK Olympic Committee for the quadrennium previous to the London Olympics, in which changes were made to the directions of all national sports, on the basis of scientific evidence. This is a route that is currently well delineated across the world: highly experienced coaches who, thanks to the unlimited scientific resources available, are now able to get internationally outstanding results, keeping in mind that the inappropriate use of knowledge or technology does not necessarily mean that you are doing “science” or using a scientific method. Training based on scientific knowledge, or “evidence-based practice” (EPB), can be defined as “the conscientious, explicit and judicious use of the best evidence to make decisions. It means integrating individual experience with the best external evidence derived from systematic research” (Sackett et al., 1996). This particular mode of training, EPB, is opposed to the methods of the past —which will increasingly tend to disappear in the future—such as training and beliefs based on pseudoscience, and belief-based coaching (Rushall, 2009). Which types of scientific contribution can be adopted in swimming? As anticipated, most scientific research has been conducted by studying adaptations in athletes from other sports. Leaving aside the specific situation is a must, that cyclic sports are closer to the individual performance model of the modern swimmer. The triathlon itself has shown that the combination of running and cycling workouts for swimming is not contradictory, as was thought in the past, but that it can also produce improved effects in swimming performance, and vice versa. The fact that high-level swimmers successfully implement methods derived from the triathlon has long been known, and the results of some elite athletes are an example that should not be neglected. The use of volumes in swimming training was thought of as only useful for the construction of the athlete in terms of his/her high-volume aerobic fitness, and requests for this type of training were made mainly in the early stages of preparation. Now the possibilities that refer to this same energy availability are numerous and high-intensity intermittent training is certainly the most discussed and probably the most effective regime that can be implemented. Already in the 1990s, it had been shown that a reduction of up to 50% of the volume of work (Costill, 1991) did not result in any decline in the physiological parameters of reference and performance of athletes. The sample of this study adopted, on the one hand, a model of constant intensity at high volumes of work (9,300m per day), while, on the other hand, a second group used more intensity at lower volumes (5,000m). The study of high-intensity intermittent training was widely diffused, thanks to a particular study of training (Tabata et al., 1996), which was originally developed for Olympic ice skaters. In this study, athletes were asked to apply an ultra-intense commitment (equal to 170% of VO2 max), followed by 10 seconds of recovery, to eight cycles developed within six weeks. The protocol consisted of four weekly sessions, with a fifth day of training at a constant speed. The results were respectable and opened up new horizons; the “Tabata” resulted not only in a 14% increase on VO2 max, compared with the control group at a constant rate with 10%, but also an increase of 28% of anaerobic capacity, which was totally absent in the control group. this research, published in Medicine & Science in Sports & Exercise, the authors (Tabata et al., 1996) indicated this increase was “one of the highest values ever recorded in exercise science”. The acronym HIT, which stands for “high-intensity interval training”, was conceived in opposition to both the traditional training method (constant speed) and steady state training (SST). Sometimes confused with other well-known forms of exercise in swimming (such as fartlek), high intensity training is a method of training heavily influenced by scientific evidence and is today one of the most effective means of improving metabolic and cardiorespiratory function. The HIT provides short/long periods of repetitive exercise, interspersed with high-intensity recovery periods. a) HIT protocols, with long, short and sprint interval variants, and different recovery times, could allow the athlete to reach VO2 max if properly designed (Fig. 2). b) Individual differences among athletes and among different high intensity training regimes should be considered, in order to respect in achieving 90% minimum of VO2 max. c) Repeated sprints and other forms deemed “high speed” should also be appropriately modulated as part of high intensity training. d) An HIT protocol designed for long or short ranges that have a higher relationship between active phase / recovery phase, and has a greater TVO2 max HIT sessions. e) HIT protocols based on countless combinations are particularly effective when used at the same time, and are still deserving of further scientific study. f) Attaching a training model to a high-level neuromuscular HIT protocol can lead to a progressive improvement of the benefits of a single HIT. Implementing a workout based on the scientific evidence surrounding high intensity training means devising and implementing a programme that takes into account nine variables (Laursen, 2002), the manipulation of which may or may not contribute to obtaining the greatest benefits by facilitating an increase of the following: end- systolic volume, plasma volume, efficiency, heart rate, blood flow, oxidative enzymes, glycolytic enzymes, buffering capacity, sodium-potassium pump, etc. In applying the methodology to the field, it is advisable to attempt to meet the criteria and reference variables following pre-built tables, but by instead applying complex reasoning to the objectives of the competitive swimmers themselves, starting from an existing evaluation made at the beginning of the season. The HIT variables are as follows: work intensity, duration, intensity and duration of recovery, work mode, number of repetitions, number of sets, and intensity and duration of recovery between sets (Fig. 3). Among the practical considerations, it should be remembered that the TVO2 max is the key benchmark, i.e., the time during which the swimmer is “really” training in the “red zone”. Following the kinetics of VO2 (Robergs, 2014), it cannot be assumed that the swimmer will achieve 90% of VO2 max in the first repetition, if not for sessions of three to four minutes. 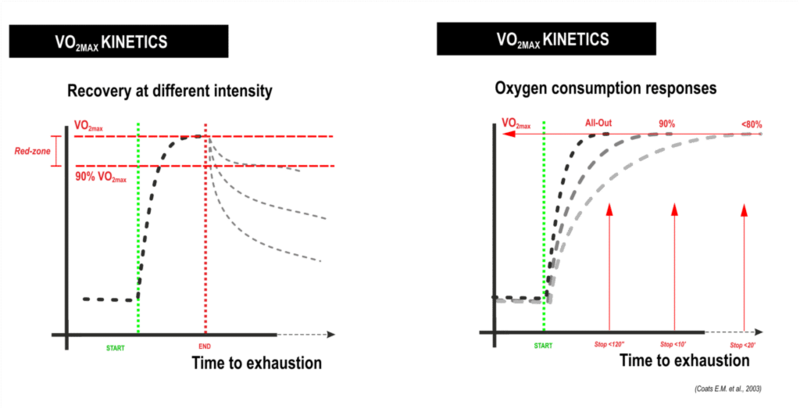 The design of HIT for repetitions of greater intensity and recovery factors of shorter duration becomes a priority, in order to grant the athlete the ability to recover; however, sharing a new phase with an intense base VO2 value (significantly higher than the initial TVO2) is always higher (Billat, 2001). It is an important aspect of the mechanisms underlying the work/recovery that, with appropriate manipulations, they can improve blood flow to accelerate muscle recovery, accelerate the resynthesis of phosphocreatine, the buffer effect on H+ ion, muscle lactate oxidation, etc. These aspects of HIT have been valued mainly for their cardiovascular aspects; however, the more appropriate and advanced application of HIT to swimming provides further features relating to glycolysis and energy contribution: a particular neuromuscular training integration which is very important in sprinters (Buchheit, 2013). The translation of scientific evidence to the field is obviously problematic in a sport such as swimming, where the systematic verification of reference values (i.e., the time to VO2 max) is limited by the absence of low-cost technology that can be used in the pool. From this, however, you can still try to work by considering the effects of recovery (Balsom, 1992), using an objective analysis of travel times. 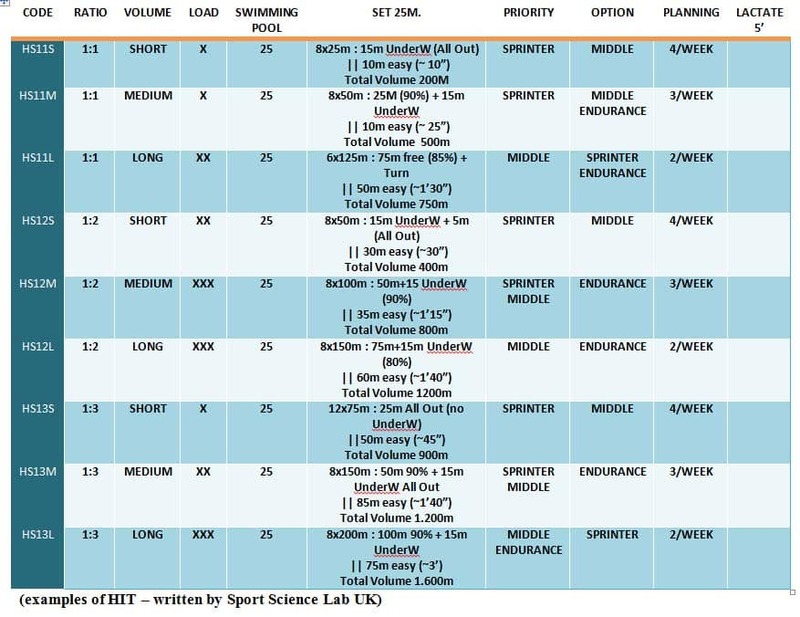 The aim of an high intensity training protocol is to maintain the level of intensity within the set parameters; in order to achieve this, and by recording all results on a spreadsheet, you can collect weekly feedback, remaining practical but in line with expectations, even though the journey times of the intense phase may tend to remain constant or, as we would expect in the first few weeks, experience a rapid increase (Fig. 4). This approach is maintained mainly because the active recovery phase must always be equal in terms of intensity and duration. High intensity training is a complex method, and is certainly the workout method that has been most investigated across the world over the past decade. Knowledge of the systems, benefits and biochemical fundamentals that underlie the method is an integral part of its implementation. It is therefore our goal to bring tables of intensity and time series into use, since every athlete, if we reason with a scientific method, can depart from their own X value and improve up to a value of Y. Only based on this reasoning is it possible to employ HIT with an athlete; otherwise, it is better to stay with other methodologies which, while perhaps less performance-enhancing, definitely allows the trainer to make more extensive assessments. The scientific evidence in support of high intensity training has increased with the number and quality of studies, especially those involving high-level athletes. It’s already known that a large number of swimmers, all over the world, are applying the basic principles of this scientific methodology using a large number of different strategies (including ultra-short race-pace training (USRPT) and swimming high-intensity training (SWHiiT), with various other sub-methodologies), all of which are based on strong scientific evidence. The methodology described in this article is SWHiiT, which is characterized by a high level of strong physiological adaptation in the VO2max aspects. Looking back on the last two decades, the scientific evidence was impaired by a large number of studies based on sedentary people. Since 2000, a large number of studies have been progressively based on physiological adaptations in already highly-trained athletes. The main differences between the groups relate to the high aerobic capacity already obtained by the high-level athletes, as well as their anaerobic thresholds and other physiological parameters. As described earlier, one of the methods already applied in good-level athletes is to increase the total weekly volume in submaximal intensity training. Generally, this only involves an increase in volume; it doesn’t appear to be related to improved performance, nor to an increase in the maximal oxygen uptake, anaerobic threshold or oxidative muscle enzymes (Laursen, 2002). This method, based on high intensity training, had physiological significance for swimmers, since the VO2 slow component (a slowly developing increase in VO₂ during constant-work-rate exercise performed above the lactate threshold, which represents a progressive loss of skeletal muscle contractile efficiency and is associated with the fatigue process ( Jones, 2011) was lower than those presented for running and cycling (Billat, 1994). This could be explained by the use of high exercise intensity, the high level of endurance training of these swimmers, and the specificity of this water sport (Fernandes, 2012). Programming a swimming workout on the basis of high intensity training evidence means working towards improvements in physical work capacity, with an increased delivery of oxygen to the exercising muscles (central adaptation) and an increased utilization of oxygen by the working muscles (peripheral adaptations). These changes are frequently considered editable by coaches in the same period of time, due to “overcompensation”; however, this is not the case, since the pathway of central adaptation is more rapid that of the peripheral, due to capillary density and mitochondrial volume. In addition, the adaptation of lactate production and glucose utilization during an exercise at the same workload are basically determined according to different delay times. An increase in VO2max, as the previously mentioned adaptations, can generally be expected from eight to 12 weeks after the protocol is begun. Attempts to achieve these results by applying an increase of volume instead of a different training stimulus have not yet been associated with improved results. Based on the evidence, an optimal stimulus to elicit both maximal cardiovascular and peripheral adaptations would be one in which athletes spend at least several minutes per session in their “red zone”, which generally means reaching at least 90% of their VO2max. Based on this principle, the major focus of the workout should not be the duration of the set, but the time spent at 90% of VO2max or above, which is known as [email protected]2max. The manipulation of the nine variables of high intensity training can help the coach optimize the workout in order to achieve the maximum [email protected]2max, with a steep decrease in the duration of sets and better overall quality. Programming an SWHiiT workout based on high intensity training means paying attention to any acute response during the session, in terms of the contribution of the three metabolic processes, as well as to the neuromuscular load and musculo-skeletal strain. The principles of adaptation and the focal areas of SWHiiT can help explain how we might use the method to design an effective workout plan. An important aspect of this is active recovery and the associated work/relief ratio, one of the key factors involved in the high quality of the Swhiit. The manipulation of the work/relief ratio can be used to maintain the [email protected]2max and to individualize the intensity for different levels of athletes. Maintaining a high level of VO2max. The active recovery has more than one benefit when compared to the classic passive recovery, as generally adopted in swimming workouts. An athlete who applies an active recovery between interval bouts reduces the time needed to reach VO2max and, in turn, induces a higher fractional contribution of aerobic metabolism to total energy turnover, delays the time to exhaustion and maximizes the [email protected]2max. The manipulation of intensity during the relief phase is also a key factor in SWHiiT; an estimation of the 50% vVO2max can be adopted in order to implement an appropriate starting point for the work/relief ratio. In every exercise, the level of VO2max increases from the baseline to a higher level at a speed related to the intensity of the effort exerted. Basically, an athlete can arrive at his/her max level of VO2 during an “all-out” effort between 20” and 35”. At the same time, the VO2max trend is related to the % of vVO2max adopted during the exercise. 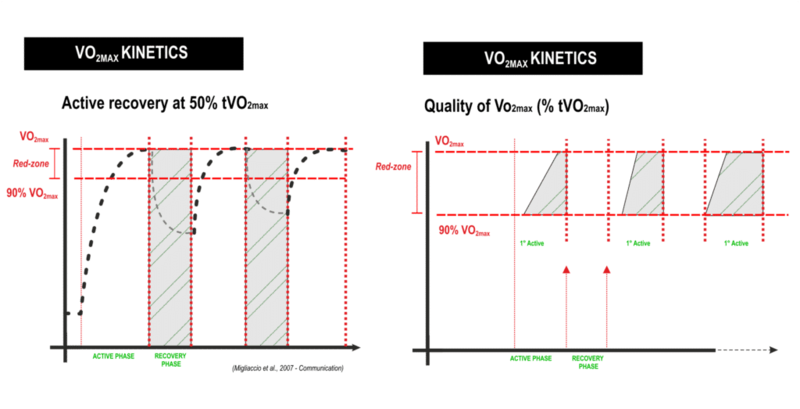 This parameter, usually denominated as “time limit” (TLim-vVO2max), expresses the maintenance of that specific constant velocity to the point of exhaustion, defined by the inability to maintain that precise velocity. Therefore, in a TLim-vVO2max assessment, the measure of performance is that of time duration. Of course, the time to exhaustion (TLim) is inversely related to the intensity of the effort, and the minimal speed at VO2max is necessary to set another variable of the SWHiiT protocol. Based on the evidence, swimmers’ TLim doesn’t follow the same kinetics as cycling, running and kayaking, and can be maintained between 2’07” to 7’45” (mean 4’47”) with a great variability depending on the type of exercise (Billat, 1996). Further studies in this area have found that TLim-vVO2max is not related to VO2max (Billat, 1996; Faina, 1997). Bearing in mind that, due to the specificity of the physiological demands of swimming, only sport-specific testing provides meaningful results, the evaluation of TLim-vVO2max in normal swimming conditions was required. A recent study (Renoux, 2001) observed TLim in a 25m pool, and the researchers found that swimmers could sustain that level of exercise intensity for 6.09 ± 1.39 min. *= In this case, because it is not an “all-out” effort but a race pace with the intensity of the “target time” (i.e., not the best time), it is necessary to pay attention to the increment of the time. If the swimmer fails two consecutive times, the set should be stopped. Following the evidence derived from physiology and the expertise of coaches, we can apply a model for a single workout using the parameters described above. In this plan, as an example, we suggest starting with a progressive warm up and a set of speed drills, and then adding a SWHiiT session in order to achieve 15’ of quality training in the “red zone” (≥ 90% VO2max). The background of the athlete, the expertise of the coach and the general environment might also suggest possible changes to this plan. 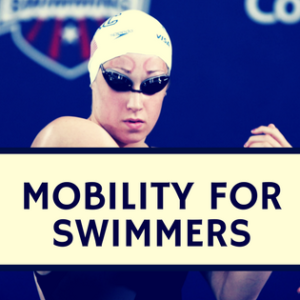 Swimming methodologies are commonly adopted primarily on the basis of the coach’s expertise; this is a key factor with elite athletes, where “trainability” is near its limits. However, research can also be useful when a coach needs to improve his/her outlook, consider new methods, achieve new results or stop a temporary decline in his/her athlete. Of course, in junior swimmers, the methodology has to be focused more on research and less on expertise; this is because we have to apply the “right” volume for each individual swimmer, and their physiology can indicate the baseline for the chosen method. In this case, following the high intensity training evidence, we are able to adopt a new method; with the right manipulation of the variables, this method can be applied to the entire team. This evidence-based methodology suggests that, while two different workouts can be “similar”, “every single little change today can generate a huge difference tomorrow”. High-volume, low-intensity vs low-volume, high-intensity training is one of the main concepts discussed. Evidence of the physiological effects of HIT (or HIIT) is of major interest for the sports science research community and every month several articles add more pieces to the HIT puzzle, including for swimming (1). However, HIT’s effects on pre- and post-pubescents are still unclear due to a lack of published scientific papers. Coaches and athletes under 13 years old are trying to achieve the best results with various different training workouts. 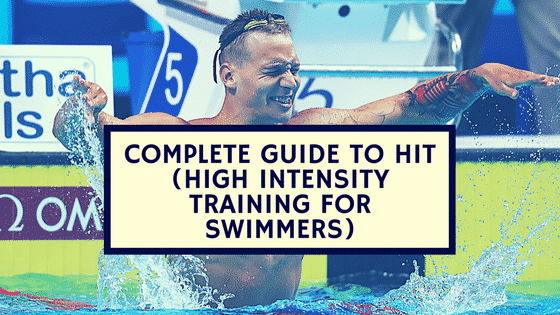 Is HIT Useful for Young Swimmers? This is a common question that has several different answers, most unrelated to evidence but rather to experience in the field. 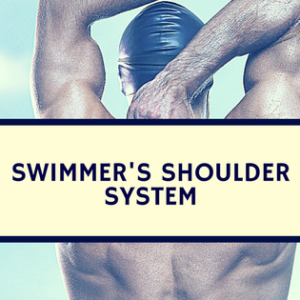 Young swimmers, in this context mostly pre-pubescents, have different physiological parameters and needs. Many factors have to be considered before planning workouts because the growth of the athlete is also related to hormonal changes that, if not complete, could affect biochemical processes and lactate production and removal during and after training. An athlete around this age often has a very compressed schedule due to school activities, so the time available for swimming is an important consideration when a coach designs their plan. Without examining the evidence, a young swimmer’s plan is often seen as a “reduction” of the normal workouts of adult athletes. This is not the case, as a pre-pubescent swimmer is not a young adult and has different physiological characteristics, so the dose-response normally applied to adults can fail with children and can be dangerous to their growth process. A young swimmer’s workout time averages 10-15 hours per week. A large proportion of this is performed as high volume, low intensity, even when the main competitions are fixed at 50m to 400m lengths (2; 3). The effects of low-intensity, high-volume training have been under investigation for a long time. Doubling volume per workout (8.970km vs 4.266km) has been shown to have no advantage for physiological parameters and sprint performance, although lactate concentration and heart rate have adapted to high-intensity training and low-volume workouts. This means a “time-saving” approach can be an effective solution for children, without impairing performance (4). A time-saving approach can have a double effect on improving performance: race-pace synchronization and start and turn training. High-intensity training can provide a large part of a timed workout, at a swimming speed closer to competition pace. 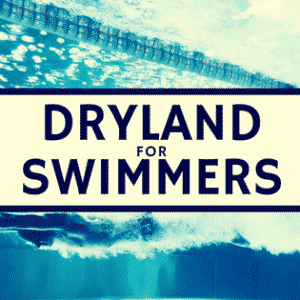 It can help a young swimmer synchronize their stroke frequency and length similar to that of a main race, following better biomechanical efficiency, with a right water-feeling in every stroke and improvement in technique. The active-rest HIT approach can be useful for young swimmers and give an effective way to help lactate removal. This is because HIT improves anaerobic pathways compared to low-intensity training. A pre-pubescent’s efficiency at eliminating lactate after effort is lower than an adult’s because of lower hormone activation; active rest can improve this. As shown earlier (link) the activity/recovery ratio has to be manipulated to be effective for both distance races and for lactate removal. How can HIT be Used? Balsom PD, Seger JY, Sjodin B, et al. Maximal-intensity intermittent exercise: effect of recovery duration. Int J SportsMed. 1992. How do I see this table for children and I would like to get access to part 2 of this journal too – is this possible please? Let me see what I can find, thanks for pointing this out. Thank you ever so much, it would be greatly appreciated! Gibala, Burgomaster, Laursen, Tschakert and studies on localized fatigue reinforces Tabata.